Mytee Extractor Bentley™ Wands featuring lightweight carbon fiber construction, 4 Stainless Steel Jets & new swivel head design. 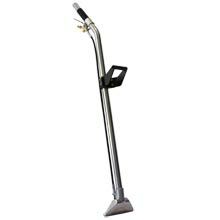 The swivel head allows the wand to run almost completely flat - clean under furniture without moving it! Mytee Extractor EZ-Glide Wands feature stainless steel vacuum tubing, High pressure, high temperature hoses & includes Mytee's Poly-Tuff™ Banana Glide™ for ease of use!